When the incumbent government was coming into power, they raised mighty slogans of change and a new Pakistan, one that would change the way we live, our manners, civic sense and take us out out of lackluster facilities. A recent incident, however, has tarnished that dream of a non-controversial Pakistan once again. The minister of tourism from Gilgit-Baltistan Fida Khan, and Law Minister Advocate Aurangzeb created senseless scenes at the New Islamabad Airport the other day. A PIA flight, that was bound to go from Islamabad Airport to Gilgit-Baltistan, was first delayed and later on cancelled. At this inconvenience, passengers including both ministers, staged a protest against the PIA authorities. However, this wasn’t to go as smooth as it did. 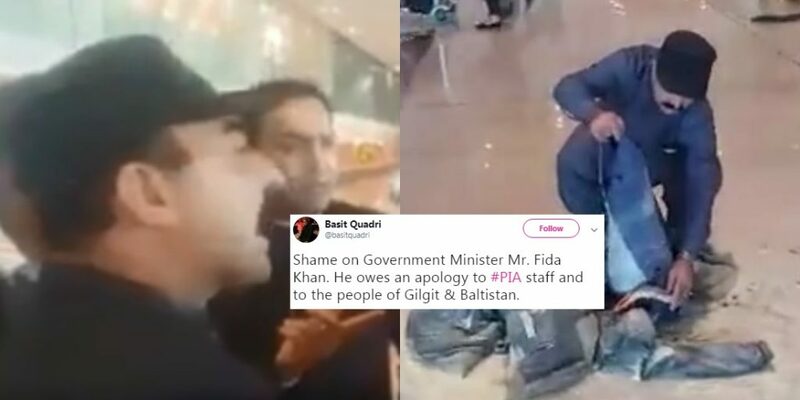 The worse of it came when tourism minister Fida Khan first misbehaved with a PIA official, later pushing and shoving him like he had committed a crime. The flight was cancelled due to the weather being inadequate and unsafe for travelling. After hearing this, the tourism minister lost his cool, that one flight had left for the same destination but the weather was only ill for the second flight. Since the person talking to the ministers was in-charge of arrivals and not operations, the ‘mob’ asked him to call in the manager operations. When the official was a reluctant to give in to their command instantly, the minister of tourism started pushing and shoving the PIA official, giving shades of the mighty old Pakistan. Later on, when the PIA officials failed to act on their commands, both ministers took off their jackets, and set fire to them right then and there. This act of theirs created a new controversial drama after their initial misbehaving. “Our luggage has reached Gilgit while we are sitting here without our belongings,” said the Law Minister in his defense. While the tourism minister burned their jackets, the law minister filmed the whole ordeal and then uploaded the videos on social media as well, which is how the act came into the nation’s knowledge. Now it is pertinent to add here that these people might be under PTI patronage, but minister of tourism Fida Khan is a PML-N member and came into power as provincial minister during Nawaz Sharif’s tenure. However, this does not undermine the fact that the incumbent Prime Minister is from PTI. Imran Khan and the rest of his cabinet need to take action against rogue ministers who first insult official staff and then in a bid to save themselves, create a drama such as burning their clothes inside an airport.